1. 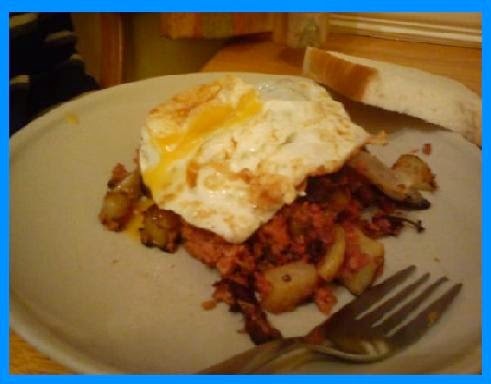 Start this off by cutting the corned beef in into four ½ inch pieces. Now chop these into ½ inch (1 cm) dice, then scoop them all up into a bowl. Combine the Worcestershire sauce and mustard in a cup and pour this all over the beef, mixing it around to distribute it evenly. 2.Now slice your onion. The potatoes need to be washed and cut into ½ inch cubes, leaving the skin on, then place the cubes in a saucepan. Pour enough boiling water from the kettle to almost cover them, let them simmer for just 5 minutes before draining them. 3. Now heat 2 tablespoons of the oil in the frying pan and, when it's smoking hot, add the sliced onions fry them around in the oil to brown for about 3 minutes altogether. 4.After that, add the potatoes and fry with the onions, they also need to be quite brown. Add a little more oil here if necessary, keep turning the potatoes and onions over to hit the heat. After about 6 minutes, add the beef and continue to fry everything to allow the beef to heat through (about 3 minutes).